Tuesday Lunch - Illinois Sparkling Co.
Reserve your spot today for Tuesday Lunch at the Tasting Room, offered every Tuesday, from 11 am – 2 pm. 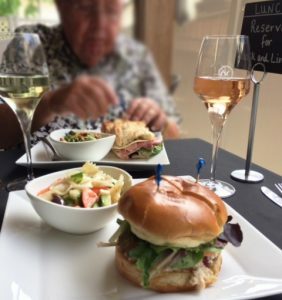 For only $20/person, you can enjoy a glass of wine of your choice and a delicious lunch (sandwich, side, & dessert) prepared by Chef Rina! Please call the Tasting Room ahead of time at 815-667-5211 to give us your lunch choices and estimated time of arrival and we will have your lunch ready for you when you come! – Kalamata pasta salad – farfalle pasta, cucumber, tomato, kalamata olives, feta cheese, and oregano with greek dressing.